Cupertino, CA, October 21, 2009 --(PR.com)-- The 42 Rules book series today announces, its newest title; '42 Rules of Social Media for Small Business' (http://42rules.com/jenniferjacobson/books/) by Jennifer L. Jacobson, which is filled with advice from small businesses across the country as well as professionals out of Twitter, Mashable, BlogHer, and eBay. Written by Silicon Valley communications professional Jennifer L. Jacobson 42 Rules of Social Media for Small Business is a practical guidebook for small business entrepreneurs looking to grow their business and connect with customers through social media platforms like Twitter, FaceBook, LinkedIn, MySpace, and Yelp. 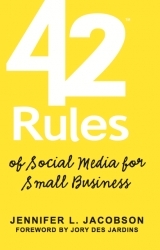 “If you’re a small business looking to implement a social media strategy, consider Jennifer Jacobson’s ‘42 Rules of Social Media for Small Business’ as your bible. Jennifer L. Jacobson is a Silicon Valley based communicator with over a decade of experience in media, strategic outreach, and public relations. Jennifer is currently the Director of Public Relations for http://www.retrevo.com and the founder of Jacobson Communication. Jennifer has helped many companies grow their outreach efforts including, companies including LookSmart Ltd., PNN.com, MarketCulture, Impact Marketing, and MerchantCircle. Jennifer has a Masters Degree in Broadcast Communications and enjoys creating new media projects in her spare time. Super Star Press, a division of Happy About®, was founded to help independent professionals establish themselves as experts in their field through writing, publishing and marketing books. The 42 Rules ™ book series delivers wisdom in the form of compact, high-impact books on personal and professional growth. To learn more visit http://superstarpress.com/about_us.html.